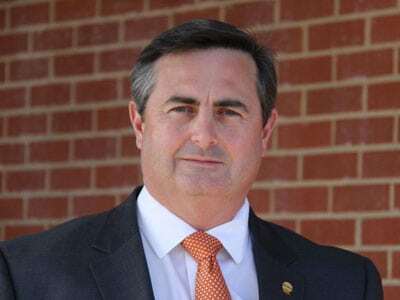 Sequachee Valley Electric Cooperative’s Board of Directors has named Mike Partin SVEC’s new President and Chief Executive Officer. Partin succeeds Robert W. (Bob) Matheny who retired earlier this month after serving for over 16 years,. Partin will be the seventh manager/CEO in the Cooperative’s 75 year existence. Partin began his career with SVEC in 1998, serving first as Vice President of Marketing and Member Services and for the past 5 years, as Chief Operating Officer. He is an alumnus Grundy County High School and Middle Tennessee State University. Partin is also a graduate of the National Rural Electric Cooperative Association’s management program at the University of Nebraska, Lincoln. Partin has also served in various capacities with industry related organizations including Touchstone Energy Cooperative, the Tennessee Valley Public Power Association and the Tennessee Electric Cooperative Association. Partin and his family live and farm in the Pelham Valley on the same land that has served his family for generations. Mike and his wife Kim, a teacher at Monteagle Elementary School, have two daughters, Macy and Maty. The Partins attend Monteagle Church of Christ. After more than forty years in the electric utility industry, the last sixteen at Sequachee Valley Electric Cooperative, President/CEO Bob Matheny retired on January 2. Matheny began his career at SVEC in July 1998, after the passing of the previous manager, Bob Pickering. Early in his career Matheny gained electric utility experience working in member and energy services with TVA and two cooperatives in Florida. He then served as general manager for Tri-County Electric Cooperative in Michigan for almost 15 years before taking the reins at SVEC. During Matheny’s tenure, the Cooperative has grown in membership, miles of line and advanced in technology, improving reliability for members and helping the Cooperative operate more efficiently. While at SVEC, Matheny served as a director on several national and regional industry-related boards, such as the National Rural Telecommunications Cooperative, the Cooperative Response Center and Southeastern Data Cooperative. Matheny was also a member of the South Pittsburg Rotary Club and served as a member of the Marion County Partnership for Economic Development and a term on the Marion County Chamber of Commerce board. He and his wife Joyce plan on retiring to Florida and spending more time with family. Sequachee Valley Electric Cooperative, a Touchstone Energy® cooperative, is a non-profit organization offering reliable, low-cost electricity to 35,000 members in Bledsoe, Grundy, Marion and Sequatchie counties. SVEC is an equal opportunity provider and employer.